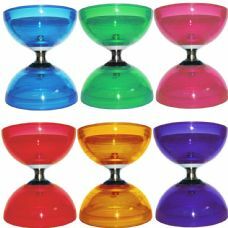 Although the diabolo is hundreds of years old the bearing diabolo is a relatively new invention. Commonly known as bearing or clutch diabolos they come in a wide variety of sizes, shapes and prices. The bearings found in these diablos allow them to speed up quicker and hold their momentum longer. A bearing diabolo benefits from either a triple or single bearing. 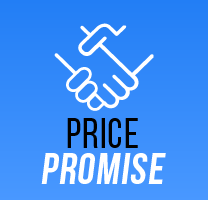 Single bearing diabolos are generally more affordable and still perform extremely well but the triple bearing offers an even quieter and faster spin. Although the bearing diablo does have huge benefits over a fixed axle diabolo there's also some drawbacks. The constantly spinning centre means that some diabolo tricks such as the elevator become impossible however it also opens up a whole world of new tricks that become easier than ever to perform! 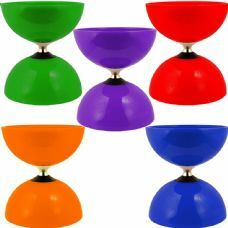 We stock a huge range of bearing diablos with the best offerings from Sundia, Henry's, Mr Babache and Juggle Dream. The Sundia Fly was one of the first bearing diabolos, Sundia have since expanded their range to include the Nimble which is identical to the Fly but with lighter cups – allowing it to be even more agile. The Shining and the newest varient the ICY are their latest offerings, they both benefit from a triple bearing and the ICY is built to withstand the harshest and coldest conditions! Henry's took their already existing line of aware winning diabolos and have applied a free hub axle to make the Circus and Jazz diabolos faster than ever before and Babache have also taken the same approach with their range. We also stock Juggle Dream bearing diabolos like the Cyclone Quartz and Hurricane. 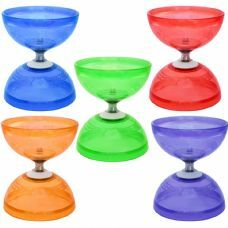 These diabolos are extremely popular and are ideal for a first clutch diabolo or for beginners but don't have the same level of precision engineering as brands such as Sundia.